If you like hip hop, rap, or disco.... this album is not for you. But if you love the epic sounds of E.L.O., Pink Floyd or Alan Parsons, among others, this album was made with you in mind. 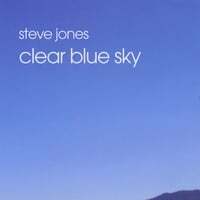 RadioIndy is pleased to present Steve Jones with a GrIndie Award for the CD "Clear Blue Sky"
Steve Jones releases another great album, titled “Clear Blue Sky,” packed with well-crafted, original classic rock songs. The vocals are smooth and relaxed on these sharp and flowing singles. Dishing up a bouncy beat, “Empty Promises” has energetic lyrics, while “Us” is slightly slower in speed but delivers wonderful harmonies. The album clearly has a high-quality production, as listeners will be able to hear the dynamic balance between vocals and instruments. A good example of this well-constructed mix is “Comes As No Surprise” and “She Said Yes” as the guitar serves up sweet licks while vocals are clean and crisp. Fans of Pink Floyd or Electric Light Orchestra won’t be disappointed when listening to Steve Jones’ “Clear Blue Sky,” as it is filled with creative melodies and vivacious beats. "Clear Blue Sky" Reviewed by RadioIndy.com! Steve Jones Press Release on Digg.com! FANS: Increase the popularity of this DIGG press release by visiting our homepage at www.radioindy.com and looking for the "Press Release" section in the lower right. Here, you can find and "DIGG" this press release for Steve Jones. The more DIGGS, the more exposure! DIGG, DIGG IT, DUGG, DIGG THIS, Digg graphics, logos, designs, page headers, button icons, scripts, and other service names are the trademarks of Digg Inc.